Let's start with the top. Like I said, I used the kimono bodice from the Sallie Jumpsuit pattern. To account for my woven fabric, I cut out a size 12, which was two sizes up from my regular size 8. And since it's just a bodice block, I lengthened it by 6 inches and extended the side seams out slightly (3/4" at hem) to account for my hips. The back and front of the original pattern are identical. This wasn't an issue in knits, but in woven , this made the back gape quite a bit. I found that my standard 1/2" forward shoulder adjustment fixed that quite nicely. However, because it's an all-in-one kimono sleeve, you'll want to make sure you only apply it to the shoulder and not the sleeve portion or it will flare out. 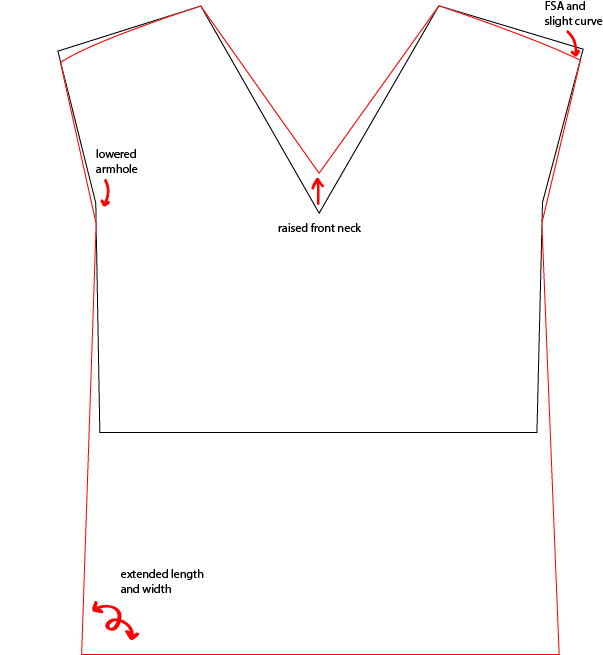 I found a slightly curved shoulder seam helped with this as well and easy to do after-the-fact if you forget. I raised the front v-neck by 1", which is perfect when the shirt is sitting properly. The neck looks high in some of these photos -- that's because it is being pulled to the back. I think the ties are weighing it down, to be honest. I may remove them yet. In terms of finishing, I drafted an all-in-one neck and sleeve facing, but didn't have enough fabric for it, so I made only a neck facing and simply turned under the sleeves. Finally, I lowered the armhole by 1/2" for a little more movement. This illustration isn't to scale, but maybe it will help you visualize everything that I did. I only made two more very slight adjustments: I took a 1/4" sliver from the center back, because I liked these to sit a bit higher on my waist and therefore had to account for my sway-back; and I made the waistband slightly narrower (by 1/2" total), because I can only find 1-1/2" elastic around here, and I just prefer the look on me. 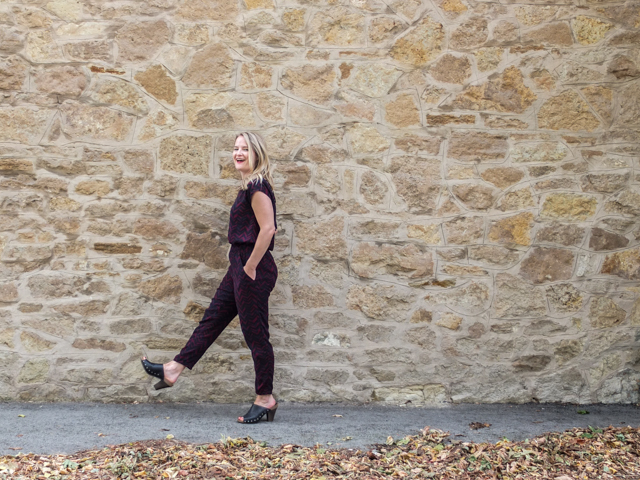 I say this all with the caveat "if you've already made a pair of knit Hudson pants that you love," because, of course, I took a more complicated route to get there. I used the Men's Hudson Pant pattern! My husband wanted a pair and I was on the fence myself, so I figured I'd save a few bucks and just make the smallest size (28) of the men's pattern. It was worth a shot for a roomier fit. My husband's pants turned out perfect the first time. Naturally, mine took quite a few "feminine" adjustments: 1" shortened front crotch, 1/2" full-seat adjustment, 1/4" tapered leg, and 3" shortened length. That's a lot more work than a typical knit project requires, and probably not worth the money saved, but it was a good learning experience for me. I'm really curious about how my changes measure up to the women's pattern and may still buy it just to see. That's how nerdy I'm getting about pattern drafting, guys. LOL! 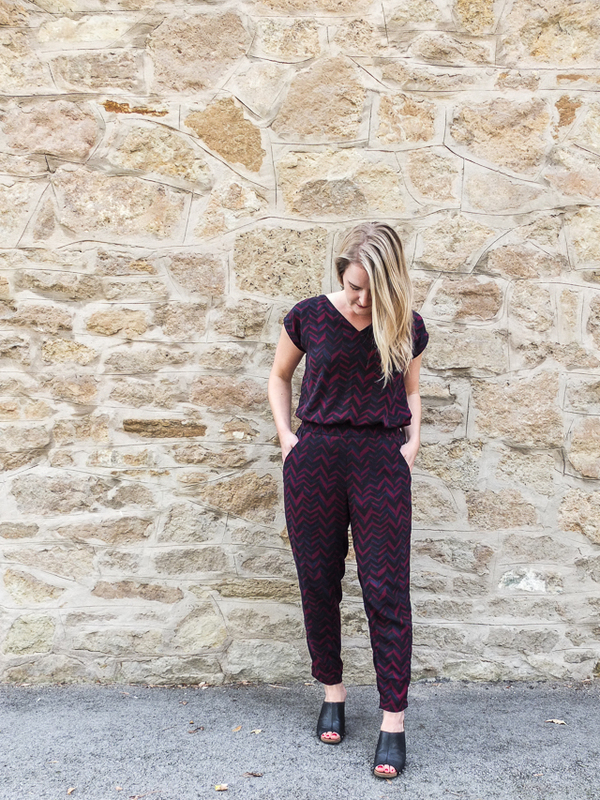 Hopefully all these pattern-hacking details don't intimidate you. They sound like a lot when they're all listed out, but are really not that difficult to execute. And also not at all necessary, if you have no interest in that sort of thing. 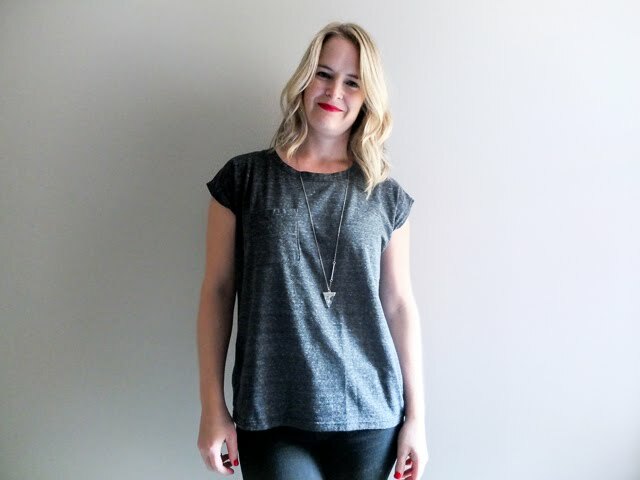 Any woven tee or tank pattern would work just as well, like the Scout Tee, Onyx Shirt, or Coram Top, to name a few. The Alexandria Peg Trousers and the Luna Pants are similar elastic-waisted style that are already designed for woven fabric. 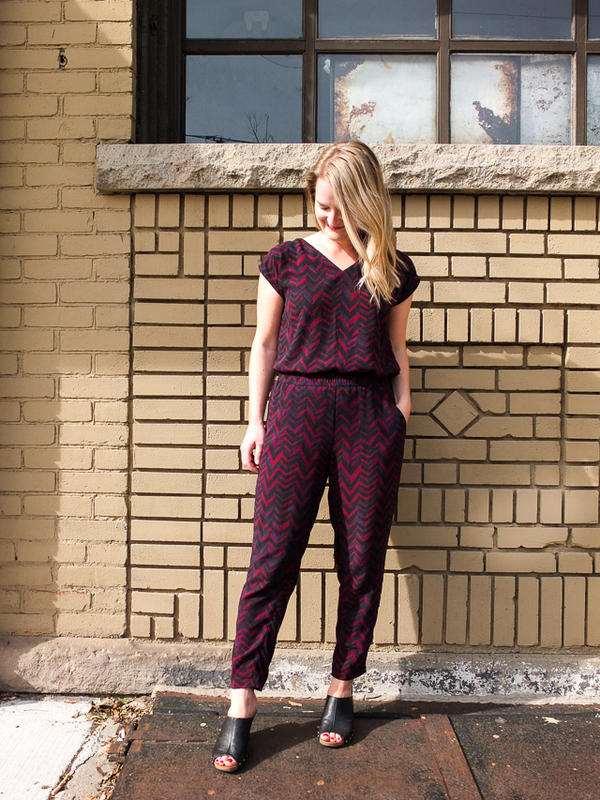 The key takeaway here is to embrace the faux jumpsuit, OK? Because we all deserve to wear pyjamas to dinner and feel like a million bucks doing it!